The Xyron® XM1255 Standard Use Laminate Refill is 150' long and is for use in the XM1255. It offers a high gloss film suitable for use on a variety of substrates and is compatible with most media. It applies edge-to-edge laminate to both sides of items, up to 12" wide. It is the perfect protection for posters, mock-ups, comps, presentations and more. The Xyron® XM1255 Standard Use Laminate/High Tack Adhesive Refill is 100' long and is for use in the XM1255. It applies laminate on one side and high tack acid-free permanent adhesive on the other side, of items up to 12" wide. It's great protection for posters, mock-ups, comps, presentations and more. The Xyron® XM1255 Permanent Standard Adhesive Refill is 100' long and is for use in the XM1255. This is a moderately aggressive adhesive that creates a permanent bond on most surfaces. Items can be touched to surface, peeled back quickly and replaced without the mess. The XM1255 applies edge-to-edge acid-free permanent adhesive to items, up to 12" wide. It's great for mock-ups, storyboards, presentations and more. The Xyron® XM2500 Standard Use Laminate Refill is 300' long and is for use in the XM2500. It offers a high gloss film suitable for use on a variety of substrates and compatible with most media. 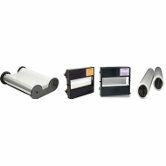 It applies laminate edge-to-edge to both sides of documents up to 25" wide. It's great protection for posters, banners, signs and more. The Xyron® XM2500 Standard Use Laminate/High Tack Adhesive Refill is 300' long and is for use in the XM2500. It applies standard laminate on one side and high tack acid-free permanent adhesive on the other side of items, up to 25" wide. It's great protection for posters, banners, signs and more. 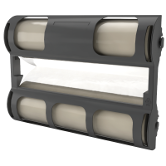 The Xyron® XM2500 Permanent Adhesive Roll Set is 300' long and fits into a XM2500. This is an extremely aggressive adhesive that instantly creates a permanent bond on surfaces up to 25" wide. It applies acid-free permanent adhesive from edge-to-edge. It's great for posters, banners, signs and more. Xyron® XM2500 Permanent Standard Adhesive Roll Set is 300' long and is for use in the XM2500. This is a moderately aggressive adhesive that creates a permanent bond on most surfaces. It can be touched to a surface, peeled back quickly and replaced. It applies edge-to-edge acid-free permanent adhesive onto items up to 25" wide. It's great for posters, banners, signs and more. The Xyron® XM2500 Repositionable Adhesive Refill is 170' long and is for use in the XM1255. It allows items to be repositioned over and over and can be removed easily from glass, walls, paper and most other surfaces*. It applies edge-to-edge acid-free repositionable adhesive onto items up to 25" wide. It's great for posters, banners, signs and more. * Please test before application as environmental conditions and type of media can affect adhesive properties. 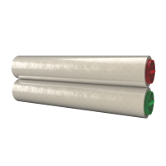 The Xyron® 850 Two-Sided Laminate Refill cartridge is 100’ long and fits into the Xyron® 850. Enjoy applying laminate to the front and the back of your precious items, up to 8.5" wide. It’s great protection for certificates, awards and more. The Xyron® 850 Permanent Refill is 50' long and fits into a Xyron® 850. It applies edge-to-edge acid-free permanent adhesive to items up to 8.5" wide. It's great for scrapbooking, rubber stamping, die cuts, craft projects and school projects. 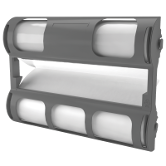 The Xyron® 850 Repositionable Refill cartridge is 50' long and fits into a Xyron® 850. It will apply edge-to-edge acid free repositionable adhesive to items up to 8.5" wide. Place, peel away and replace items with the flexibility of repositionable adhesive. Great for kid’s projects, stenciling and more. The Xyron® 850 Laminate/Permanent refill cartridge is 50' long and fits into a Xyron® 850. It laminates one side and applies edge-to-edge acid-free permanent adhesive on the other side. It's a great protection for signs, packages and more. 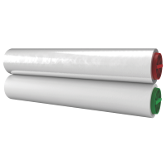 The Xyron® 1200 Two-Sided Laminate Refill cartridge is 100’ long and fits into the Xyron® 1200. Enjoy applying edge-to-edge laminate to the front and the back of your precious items, up to 12" wide. It’s great protection for certificates, awards, art work and more. The Xyron® 1200 Permanent Refill is 50' long and fits into a Xyron® 1200. It applies an even edge-to-edge layer of acid-free permanent adhesive to items up to 12" wide. It's great for scrapbooking, rubber stamping, and more. The Xyron® 1200 repositionable refill cartridge is 50' long and fits into a Xyron® 1200. Applies edge-to-edge acid-free repositionable adhesive to items up to 12" wide. Place, peel away and replace any item with the flexibility of repositionable adhesive. Great for kids projects, stenciling, and temporary decor. The Xyron® 1200 Laminate/Permanent Refill cartridge is 50’ long and fits into the Xyron® 1200. It laminates one side and applies edge-to-edge acid free permanent adhesive on the other. It is perfect for photos, scrapbooking, memorabilia, displays, signs, banners and more. The Xyron® XM4400 Standard Use Laminate Refill is 300' long and is for use in the XM4400. It offers a high gloss film suitable for use on a variety of substrates up to 38" wide. It applies laminate to both sides of documents, from edge-to-edge. It is compatible with most media and is great protection for banners and signs, advertisements, and POP displays. The Xyron® XM4400 Standard Use Laminate Refill is 300' long and is for use in the XM4400. It offers a high gloss film suitable for use on a variety of substrates and compatible with most media. It applies an even layer of edge-to-edge laminate to both sides of documents up to 42" wide. It's great protection for banners and signs, advertisements, and POP displays. The Xyron® XM4400 Standard Use Laminate/High Tack Adhesive Refill is 300' long and is for use in the XM4400. It applies laminate on the top surface and high tack adhesive on the bottom surface of items up to 42" wide. It's great protection for banners and signs, advertisements, and POP displays. The Xyron® XM4400 Permanent High Tack Adhesive Refill Cartridge is 300' long and fits into a XM4400. This is an extremely aggressive adhesive that instantly creates a permanent bond, on surfaces up to 42" wide. It applies permanent high tack adhesive from edge-to-edge and will not peel. It's great for banners, signs, advertisements, and POP displays.